Aposematic coloration refers to the conspicuous colors some animals exhibit to advertise their unpalatability or warn of peril to potential predators. A familiar example is the black and yellow/orange stripes of bees. Black and orange aposematic coloration extends to flatworms (ex. sea slugs), reptiles (ex. coral snakes), fish (ex. lionfish) amphibians (ex. newts and frogs), as well as other insects (ex. butterflies). Since sea slugs, lionfish and amphibians are aquatic and all the other animals above are terrestrial, it stands to reason that black/orange is visible both underwater and on land. The diurnal activities of bees and crepuscular activities of frogs implies the colors are visible both in the daytime and in the dusk. A takeaway is that these patterns, which juxtapose light and dark colors, are effective in a variety of environments. Can the aposematic pattern actually be seen both in the light/dark and water/air? What makes the pattern recognizable to target animals across animal groups? How are these colors generated by the animals? Many more questions can be asked, such as: Do non-target/non-predator animals also see these colors? Let’s make a start by looking at mammalian predators, such as ourselves. The retina of the mammalian eye contains three sets of light sensors: rods, cones and ganglion cells. Rods sense light and dark using the visual pigment rhodopsin. Cones contain three types of pigments called photopsins which sense different wavelengths of light. Finally, ganglion cells sense color through a pigment called melanopsin, which is stimulated by light of one color and suppressed by light of another color. Melanopsin is a protein encoded in the genome, but photopsins and rhodopsins share a pigment derived from carotene, called 11-cis retinal. The 11-cis form absorbs a photon of light and isomerizes to the all-trans form (see the figure). This conformation change initiates a series of events that stimulate vision centers in the brain to “see”. However, because of the shared visual pigment in rods and cones, activation of rods supresses the activation of cones. In the dark, therefore, it is hard to see color, but light and dark can be perceived 1. Thus the light/dark banding pattern can be seen independently of color. The color is less important than the contrast it provides to the pattern. So, we have established that black/orange is a good choice to be visible, both on land and in water, and in the dark and in the light. Now, does the correlation of black/orange to dangerous actually stand up to scrutiny? After all, we have all heard about tasty Viceroy butterflies which look enough like the nasty Monarchs to fool birds into leaving them alone. Obviously, all that is black/orange is not dangerous. But how come Viceroys, which are a completely separate species from Monarchs, even get the same coloration? This is due to a phenomenon called mimicry, something that interested Charles Darwin. In 1861 H.W. Bates wrote to Darwin about Volucillae flies, a type of hoverfly in the Amazon, which lays its eggs in the nests of bumblebees and social wasps. The hoverfly larvae eat the detritus of the nest without harming the bees or their larvae. Bates wrote to Darwin: “…some species wear the dress of species belonging to widely different families. But here the object of the analogical resemblance is different. Here it is because the one set of species is exposed in the adult state to a persecution by insect enemies from which the other set is free.”2 Bear with me and savor this beautiful and descriptive language – “wear the dress” – that modern science writing abjures. To go back to the topic, this type of mimicry is a form of bluffing, where the harmless mimic which is persecuted adopts “the dress” of the model which is “free” from insect enemies. Today, this type of resemblance, where a harmless species mimics a noxious species is called Batesian mimicry, after H.W. Bates, the author of the letter quoted above. The other type of mimicry is called Müllerian mimicry, after J.F.T. Müller, who spent his professional life, like H.W. Bates did, in the Amazon. He noticed that many noxious butterflies resembled each other. This was an honest mimicry – all the butterflies that “wore the dress” were nasty. This is the type of mimicry that wasps and bees, both of which can sting, exhibit. [The coloration of drones must be rationalized as Batesian mimicry.] The rationale given to this type of honest mimicry is that other animals learn quickly to avoid all animals with the same coloration, saving everyone some time and nuisance. 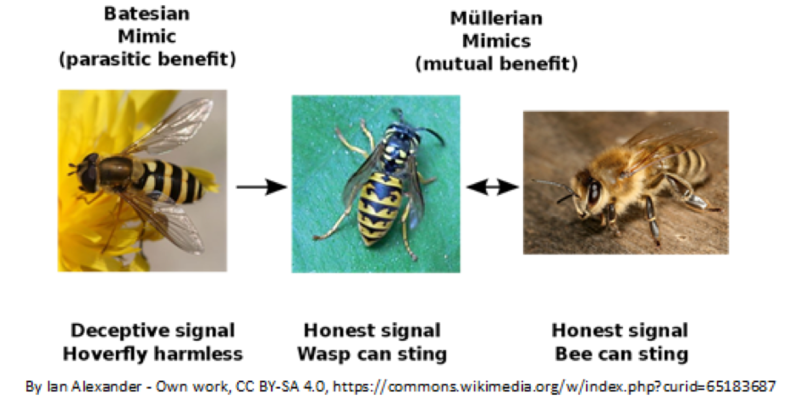 Thus, the colors used in Müllerian mimicry are all aposematic, the ones in Batesian mimicry are not. See the figure for a summary. Finally, what pigments are these aposematic colors made of and are they genetically related? Animals are divided into two major groups – protostomes (invertebrates except starfish) and deuterostomes (starfish and vertebrates). The genes for these aposematic pigments are shared, but the mechanism by which the patterns form is a little different in vertebrates and invertebrates. The aposematic vertebrates discussed here (fish, amphibians, reptiles) contain chromatophores made up of melanophores (with the pigment melanin which ranges from black to yellow), xanthophores (with the orange/yellow pigments pteridine and carotene), and iridiophores (with guanine crystals that reflect light at different wavelengths based on their orientation)3. The cells containing these pigments originate early and migrate to their final positions during development. Many invertebrates show complete metamorphosis and, like honeybees, develop from crawling larva into flying adults. Pigments in bees are expressed in epidermal cells and, by a poorly understood process called “sclerotization”, are crosslinked to the secreted chitinous material that becomes the exoskeleton during development 4, and serve to make the exoskeleton both tougher and pigmented. All this happens out of sight inside the capped cell and, finally, a worker bee will emerge resplendent in her Müllerian-designed black-and-orange striped dress to warn all and sundry not to mess with her. Joesch, M., and Meister, M. (2016) A neuronal circuit for colour vision based on rod–cone opponency, Nature 532, 236. Bates, H. W. (1861) Darwin Correspondence Project, “Letter no. 3271,” http://www.darwinproject.ac.uk/DCP-LETT-3271. Kikuchi, D. W., and Pfennig, D. W. (2012) A Batesian mimic and its model share color production mechanisms, Current Zoology 58, 658-667. Wittkopp, P. J., and Beldade, P. (2009) Development and evolution of insect pigmentation: genetic mechanisms and the potential consequences of pleiotropy, In Seminars in cell & developmental biology, pp 65-71, Elsevier.